Centered on a dark blue field is the geographical shape of Kosovo in a gold color surmounted by six white, five-pointed stars – each representing one of the major ethnic groups of Kosovo – arrayed in a slight arc. 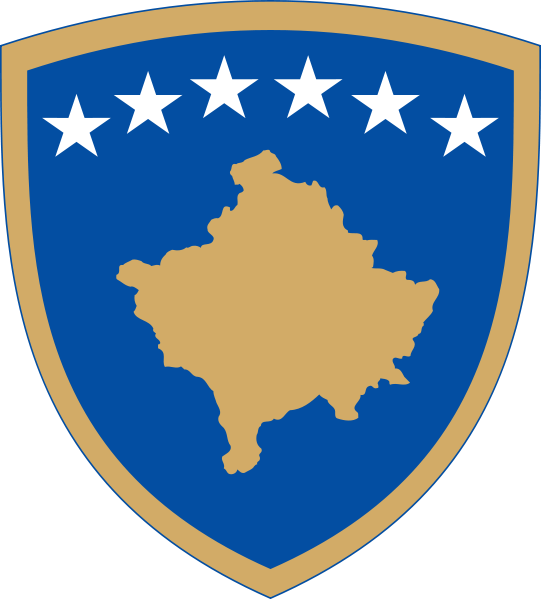 Coat of Arms of Kosovo shows six white stars in an arc above a solid golden shape of Kosovo as seen on a standard projection map, placed on a rounded triangular shield with a blue field and a golden border. Europe is the national anthem of the Republic of Kosovo. The anthem has no lyrics. It was chosen because it contained no references to any specific ethnic group. It was elected by the Assembly of Kosovo and adopted on 11 June 2008.